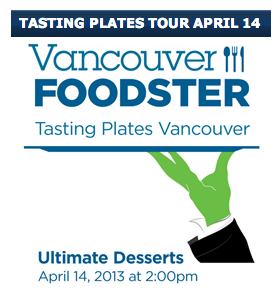 Tasting Plates Vancouver is a new event to tantalize your tastebuds, presented by Vancouver Foodster (whom you may recall from the recent Cheesecake Challenge where locals once more voted us in for best cheesecake in Vancouver!). Trees Organic’s cafe at 2655 Arbutus St. in Kitsilano is proud to participate for this one-day tasting extravaganza on April 14 from 2 pm to 5:30 pm. Trees Organic Voted Best Cheesecake in Vancouver (Again)! 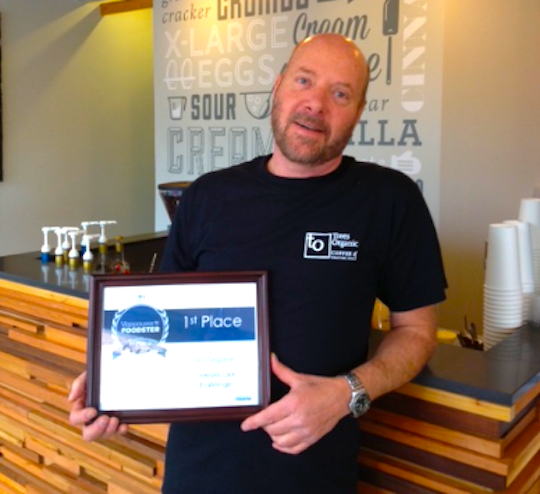 Trees Organic Coffee & Roasting House’s Owner Doron Levy holds our victory plaque for the Cheesecake Challenge! The Vancouver Foodster Cheesecake Challenge was a huge success featuring 12 Cheesecakes around Vancouver, North Vancouver and Richmond. Each restaurant featured their cheesecake from March 7-28th, and then the public voted between March 26-31. The cheesecake creations ranged from the traditional to non-traditional. With 580 votes, our Raspberry White Chocolate Cheesecake was 53 ballots ahead of the nearest competitor — and had more than five times the votes of the rest of the competition, combined. Wow. Thank you, Vancouver!